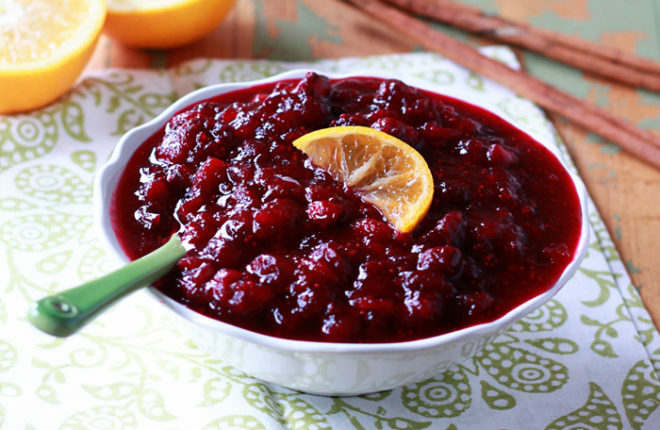 Sweetened with pure maple syrup instead of refined sugar, this easy homemade cranberry sauce recipe is a healthier spin on the favorite Thanksgiving condiment. We love the subtle seasonal flavors that the orange and cinnamon impart. Every year, one of the first things I make for the big Thanksgiving feast is cranberry sauce. For one, I usually like to create a new recipe or two for here on the blog. But also, homemade cranberry sauce freezes stunningly, so it’s a super easy thing to make weeks (or even months!) ahead of time, then I freeze it and forget about until Thanksgiving. This year, I thought I’d try something a little different. See, I’ve gotten to the point to where I rarely use granulated sugar any more, instead sweetening my recipes with pure maple syrup or honey. I know that syrup and honey are still sugar – just different kinds of it – but I feel better using more natural forms as opposed to the refined stuff. Baby steps. Conveniently, pure maple syrup is so quintessentially “fall” that it goes perfectly in a myriad of seasonally appropriate recipes. 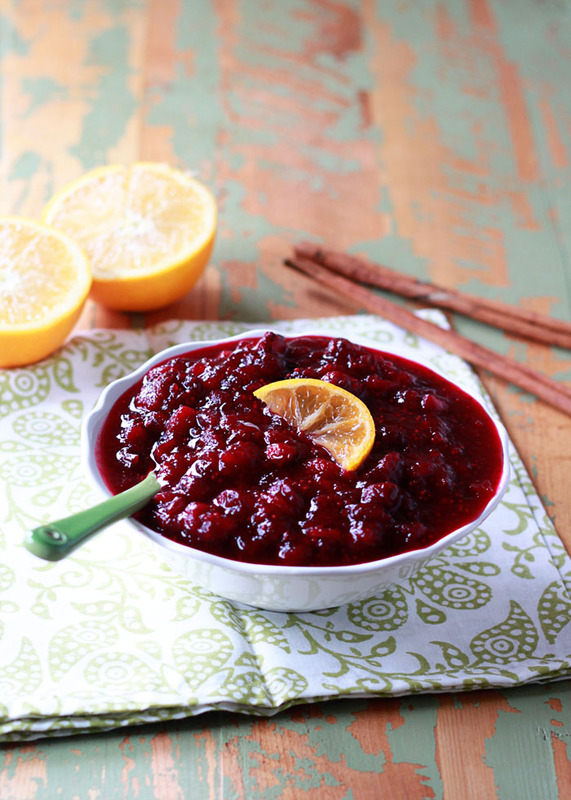 Like: Maple Orange Cranberry Sauce! First off, a disclaimer. You actually can’t really taste much of the maple syrup in this recipe – just a hint. Part of the reason is because cranberries have such strong flavor that they overpower any maple subtleties. The other reason is that I use Grade A syrup, which is much lighter than the more-intense and much more flavorful Grade B. So keep that in mind if you make this cranberry sauce recipe. The orange and the cinnamon, on the other hand, you can definitely taste – though not in an overpowering way. 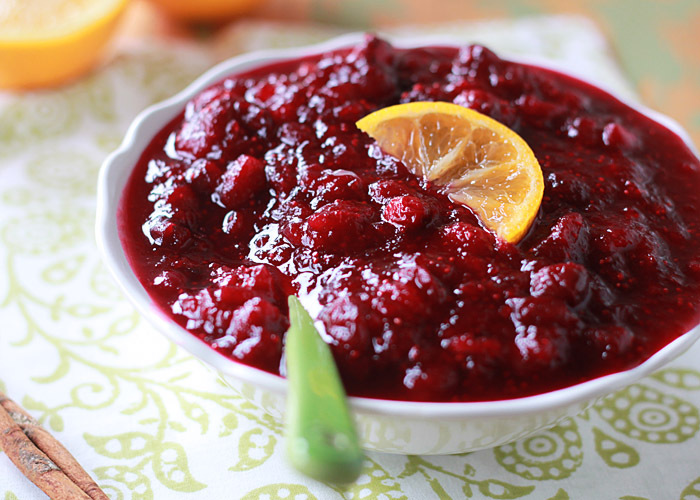 Orange zest and juice highlight the best of the cranberries. Meanwhile, simmering the sauce with a stick of cinnamon adds another festive note. Make it now, freeze it for later. 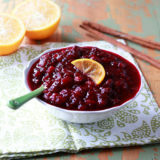 That’s the very best thing about homemade cranberry sauce – other than the fact that it tastes incredible, of course! Rinse the cranberries. Discard any mushy or underripe berries and stems. Place a medium-sized saucepan over medium heat and add the cranberries, 1/3 cup pure maple syrup, orange zest, orange juice, water, and cinnamon stick. Cook, stirring occasionally, until the mixture comes to a boil. Continue boiling over medium heat until the berries burst and break down, forming a sauce, 15-20 minutes. Taste for sweetness. If it’s too tart, add more syrup – a tablespoon at a time – until the sauce tastes sweet enough for you. Remove from the heat and let cool. Spoon into your serving container to serve or store in an airtight container, refrigerated, for 3-4 days. 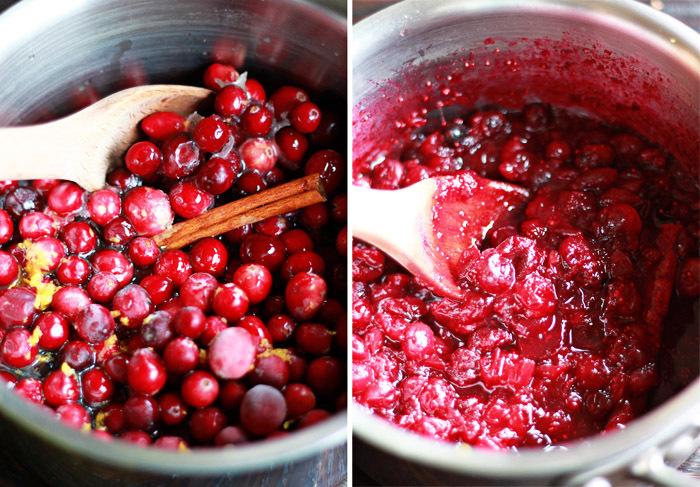 You can also freeze your cranberry sauce for up to 2 months – I do this every Thanksgiving! Just place the sauce in an airtight container or zipper freezer bag and transfer to the freezer. Move to the fridge to thaw about 24-48 hours before the big meal. 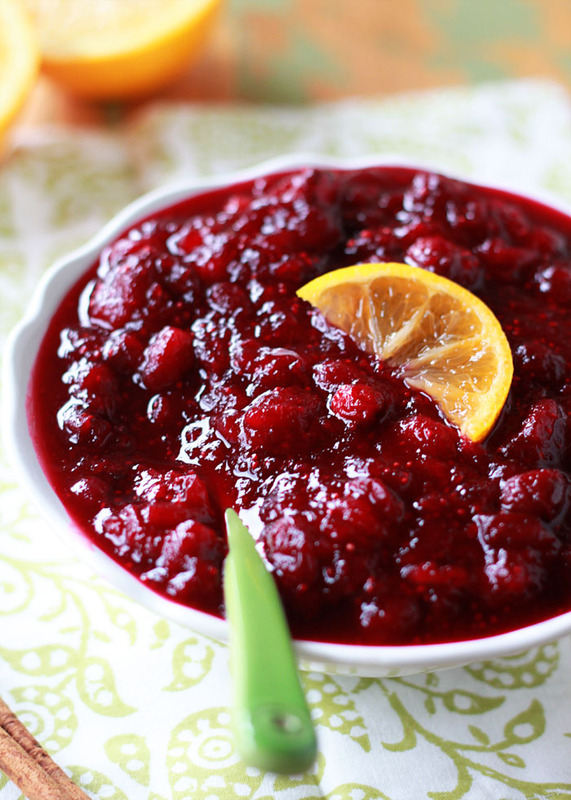 We don’t celebrate Thanksgiving here in Australia, but I am rather fond of cranberry sauce anyway! I’m actually envisioning this spooned over cold vanilla bean ice cream on a hot Aussie summer night 🙂 Thanks Kare and happy Thanksgiving preparation! Looks good..I make about the same thing, but I never tried the cinnamon. I’ll give that a try..
Btw, your pan looks like its Aluminum! Throw it out, very unhealthy..
Hi Karen. I just wondered what your recommendation would be for usung ground cinnamon, rather than a cinnamon stick. How much would you use and when would you add it? Can’t wait to try this. Thanks for the recipe!! I’d start with 1/4 teaspoon and then add more at the end if you decide it’s not quite enough! I like to go light with the ground cinnamon at first because it can vary in strength and you can always add more. Happy Thanksgiving! Hi Karen – this looks so good! I just want to let you know that I included it in my List of Fabulous Finds on my blog today … today’s finds are links to recipes for a completely fabulous Thanksgiving feast. I can’t wait to serve this! Thank you for sharing this recipe! I’ve made this for both sides of family Thanksgiving for the past two years and it’s always a big hit. I have some texture-conscious eaters, so I add an extra step of pushing it through a sieve. It’s a bit of hard work, but gives the sauce a velvety smooth texture and really highlights the flavors. Aww, thank you for the nice comment! I hope you had a wonderful Christmas, and Happy New Year! Sounds delicious I make one similar but I put actual pieces of the orange rind right in the sauce and I add chopped walnuts. Will definitely try the maple syrup as my kids and grandkids are all from Canada.